For almost 2 years now I haven't used shampoo. Instead I've been using conditioner to wash my hair with. I ditched shampoo because I thought the idea was ingenious and had to try and my hair was in awful awful shape despite rarely washing it and never using hot tool on it. I've gone through a few brands in the last while, some work better than others for me, and I would guess it would be the same for others. Personally my favourite conditioners have always been hair masks, they leave my colour treated hair soft and since I started only using conditioner on my hair I've also noticed they leave it cleaner and less greasy than regular conditioners do. I used to use Avon's Planet Spa Mediterranean Conditioning Olive Oil Hair Mask but sadly it is no longer available. This lead to a year long search for a new conditioner to love. 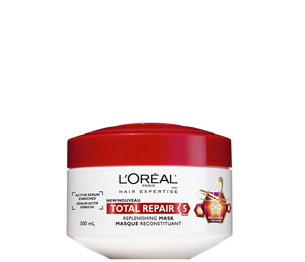 I recently reviewed L'oreal total repair 5 line and I must say I love this stuff. My hair feels light, fluffy, clean, everything I want in a conditioner. I love this stuff. If I am repeating with a second conditioning I usually use as the first a cheaper conditioner and then a mask the second time. I do this about 2 - 3 times a week. I tried out Wen which is a commercial co-poo brand but it just didn't cut it when it came to moisturizing. So there you go, quick easy and my hair is healthier than ever. I've been asked about build up. As I said I had heavy hair for a while until I found the L'oreal mask. If you use a lot of product or find your hair is fine some times a rinse of apple cider vinegar and water can be used to remove any buildup. I don't find this necessary any more but it is helpful at times. Another good thing to use is Neutrogena anti-residue shampoo. I know it is heavy duty but once a month it will take any build up out of your hair. Although I only wash 2-3 times a week I have done it everyday and found the results just as good and my hair wasn't stripped of it's health.